Side view and rear-view mirrors are some of the simplest yet most effective features on vehicles today. They make it so that you can see other motorists behind you and next to you while sharing the road. Unfortunately, as great as these mirrors are, they are not 100 percent effective at helping you avoid a car accident. This is because blind spots still exist, and blind spots lead to accidents more often than you might think. According to the National Highway Traffic Safety Administration (NHTSA), approximately 840,000 blind spot accidents occur each year. Of those incidents, almost 300 fatalities occur. Recent technology has added sensors to sideview mirrors, alerting drivers to other motor vehicles in their blind spot. Unfortunately, these sensors do not always work, and sometimes they do not register smaller vehicles like motorcycles. This can set the scene for a collision resulting in catastrophic injury. So, what can you do to avoid falling victim to a blind spot car accident in New Jersey? Adjust Mirrors: For starters, the best way to eliminate blind spots is to take the time to properly adjust your mirrors. More often than not, people mistakenly overlap their mirrors, meaning that they see the same area through their mirrors. This area is usually directly behind the vehicle, which does not help locate vehicles next to you on the road. Your field of vision should be wide enough so that you can see parts of vehicles traveling on either side of you. Put in the time to adjust your mirrors. Use a friend to stand in different spots while you remain in your car adjusting the mirrors to maximize your field of vision. Do not wait until you are already on the road and driving to adjust your mirrors, as that distraction could lead to a collision. Use Your Head and Eyes: Another important tip to avoid a blind spot car accident is to use more than just your mirrors when changing lanes. You should do a quick check with your own eyes by briefly turning your head to see the lane you want to move into. Vehicles traveling quickly might not show up in your mirrors, but a quick head check could make all the difference. Use Your Turn Signal: You should also be sure to use your turn signal before you begin your lane change. Your turn signal tells other motorists of your intention to change lanes, which lets them know to give you ample space to do so. If they are close to your vehicle, they may be able to let you know that they are there by beeping their horn. Stay Out of Other Vehicles’ Blind Spots: Do your best to avoid driving in another vehicle’s blind spot. A good rule of thumb for this is that if you cannot see a driver through their mirrors, that means they probably cannot see you. Taking the time to maximize your visibility and safely check your blind spots can greatly help you avoid a car accident. However, not every accident is preventable and not every motorist is as cautious as you. 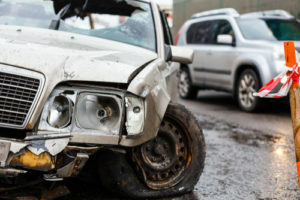 If you or a loved one has been injured in a car accident because of a negligent driver, you need the expertise of a New Jersey car accident lawyer. If a negligent driver caused your car accident and injuries, you should not be responsible for the costs of those damages. The legal team at Blume Forte Fried Zerres & Molinari in New Jersey stands by this sentiment. We will work diligently to get you the compensation you deserve. We will handle the legal proceedings while you concentrate on making a full recovery. Our attorneys have represented car crash victims in Bayonne, Mount Olive, Jersey City, and Manalapan, NJ. For more information on what we can do for you, call (973) 635-5400 or fill out the online contact form today. We have a main office at 1 Main St, Chatham, NJ 07928, in addition to offices in Jersey City, Sea Girt, and North Bergen, New Jersey.